What Exactly Is a Dog Shock Collar? Who Should Use a Shock Collar? Are Dog Shock Collars Dangerous? Does Shocking With a Remote Training Collar Hurt Your Dog? Are Shock Collars Effective for Aggressive Dogs? Should I Use a Shock Collar to Train My Dog? Whether you are a first time dog owner worried about keeping your dog safe, an experienced dog owner who wants to push the limits of obedience, hunting, or canine sports, are you are a trainer working with clients’ dogs on problem behavior, a remote training collar which is commonly known as a shock collar, remote training collar, electric dog collar or e-collar can be a useful tool for you. 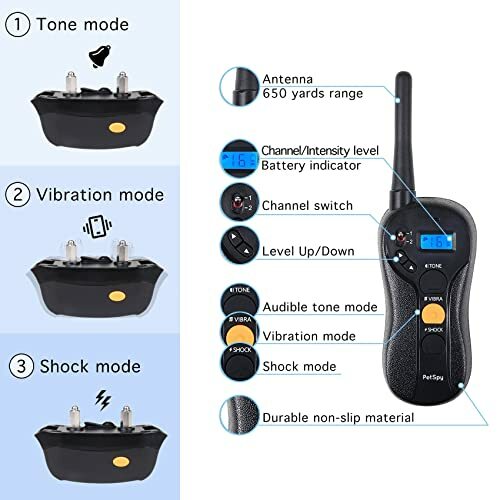 The best dog shock collar for your dog lets you communicate with your dog easily and effectively no matter where she is. By tying the beep to a reward, you can teach your dog what kind of behavior earns rewards. The vibration can distract from negative behavior. A shock can prevent a dog from running into traffic or another dangerous situation. Everything you need to know before purchasing a shock collar. Top 10 best dog shock collars reviewed and tested, include pros, cons. A detailed comparison will help you choose the right collar for your needs. Ultimate guide to use the remote collar safely and effectively. If you are looking for a quick comparison of shock collars on the market, skip to the table below. The dog shock collar for you will meet your specific training needs. 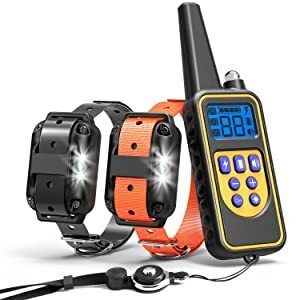 If you need to train your dog at long distances, even out of sight in a forest or tall grass, choose a remote training collar that has good range. If you often walk or hunt with your dog at night, choose a collar with a light so that you can get her attention and see your dog at the same time. If you have more than one dog to train or are considering adding to your pack in the future, choose a remote training collar that can support as many dogs as you have or expect to have. You won’t want to balance two or more controllers. Does your dog like the water? Choose a collar that can handle some depth if your dog likes to dive to retrieve. Read our detailed reviews of the above remote training collars below for complete information. 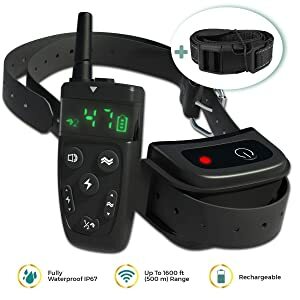 If you are looking for an affordable remote training collar that offers beep, vibration, and shock for a very reasonable price, this might be the collar for you. 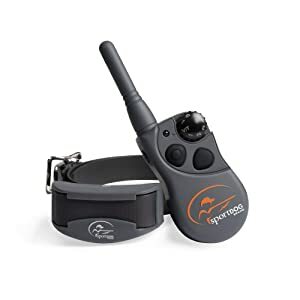 This is a good remote collar for training the family dog around the house and yard, at a smaller park, or for leash training. This is an affordable product that does the job well for most people. 330 yard range. This collar features a 330 yard range, which is good for training in the yard or smaller parks. 100% waterproof. Waterproof so won’t be damaged by rain or splashes, but not good for submerging. 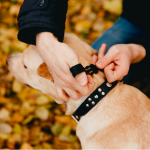 Users find this collar to be very effective for controlling one or two dogs off-leash. Most users found the shock highly effective at levels of 20 or below. Dogs could be turned off from running into the street or towards a person with the appropriate shock. The digital screen means you need to look at it for a moment to see what setting you’re on, which makes snap corrections difficult and it doesn’t have as far of a range as more expensive collars. This isn’t the most affordable collar on the market, but it isn’t terribly expensive either, and it can control dogs for a long distance, making it an effective training collar for hunting or sports. This fully waterproof collar has customizable vibration and shock as well as a beep and a light function. The light function is an extra that most remote training collars don’t feature. 1200 foot range. 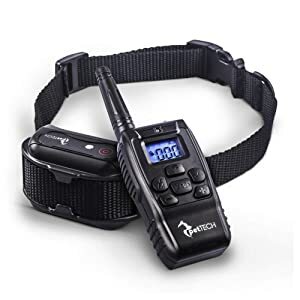 This is a very long range that can allow you to communicate with and control your dog even when she is out of sight and earshot. This makes it an ideal training collar for hunting and long-distance dog sports. Features light function as well as tone, vibration, and shock. Most collars don’t feature a light function, so this features sets this collar apart as an especially good choice for those who would like to be able to see their dog at night. Customizable shock and vibration from level 0 to 100. Fine control of shock and vibration means that you can deliver exactly the level of stimulation required. 100% waterproof. Won’t be damaged by rain or a splash into the pool or pond, but this collar is not suitable for extended submersion. Long lasting battery. You won’t have to charge this collar too often, thanks to the long-lasting rechargeable battery. Lifetime warranty. If your collar gets damaged you can show a customer service representative the problem and be sent a free replacement. This is a great collar for long range and nighttime use. Users found it effective for training hunting dogs or for use in sports and other activities. It lasted well for most users, and those who needed to trade it in for a replacement found customer service to be accommodating. The remote has a tendency to change channels while it is in your pocket, which can be a problem, especially if you pull the remote out to use it and find it doesn’t communicate to the collar. Do you need to control more than one dog at a time? This versatile remote training collar can control up to nine dogs with one transmitter. 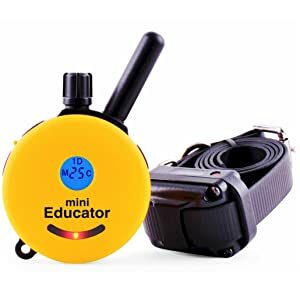 If you have a house full of dogs or are trying to train dogs in a daycare or kennel environment, this might be the perfect affordable tool for you. It features an extra safety feature to keep you from ever accidentally shocking any of your dogs, with the security keypad lock. The long range is appropriate for training hunting dogs or controlling multiple dogs at a dog park. 1000 foot range. This long range is great for a lot of uses. It isn’t the longest on the market, so if you want to train hunting dogs when they are out of sight, you may want to opt for a longer range. Control up to 9 dogs with one transmitter. The real sell of this collar is its capacity to control up to nine dogs at once. You can have control of your pack with the push of a button. Customizable shock level 0 to 99. Highly customizable level allows for the correct shock to keep each of your dogs safe in an emergency. Security keypad to prevent accidental shock. You will likely carry this receiver almost all of the time, so it is important that it is completely protected from accidental firing. This impressive product can control up to nine dogs with one remote. 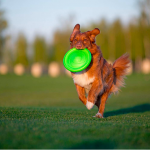 Users are happy to give dogs the freedom to play off leash while continually enforcing recalls and having the comfort of an emergency shock if one of your dogs should run towards danger. The vibration level of this collar is not customizable, so if your dog doesn’t respond to the vibration you won’t be able to make it more intense. Some users found a slight delay between the signal and the collar receiving the signal. This discrete little collar isn’t cheap, but it offers an innovative approach which can make training easier and more effective, and it covers an impressive ½ mile. If you have a tiny dog, this is one of the few training collars that can work for you, since it is approved for dogs as small as five pounds, all the way up to 100 pound dogs. The Pavlovian tone makes discipline intuitive. Hold down the button and the dog will hear a brief tone which will be followed by shock unless the button is released. Only use the shock in case of an emergency like your dog running towards the road. The hope is that your dog will learn to anticipate a shock after the tone and will stop with the tone. This is a good collar for keeping family dogs safe off leash. ½ mile range. This long range will keep your dog safe even if she ranges from you for a long way on your walk. Unique Pavlonian button Pairs a tone with stimulation to teach dogs more easily and prevent the need for shock. Boost stimulation. Lets you quickly get your dog’s attention when the normal setting isn’t effective so that you won’t have to shock more than necessary but can still feel confident of being able to stop your dog. “Blunt” stimulation. Isn’t as painful as the sharper stimulation provided by most shock collars. Still should only be used in cases of emergency. This little collar uses behavioral science to keep your dog safe in emergencies using fewer and less intense shocks. It is discrete and effective and safe even for very small dogs, so it is great for household and urban use. This collar isn’t cheap, and if you want to control two dogs, you’ll pay a lot more than you would for competing collars. 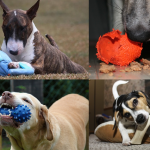 Unless the pavlovian tone, effectiveness for small dogs, or another features stands out to you, you may choose to opt for a more affordable model. This powerful tool has a good range to train your dog even at large dog parks or train hunting dogs effectively. The high-quality signal will also work through obstacles like tree cover. You can train up to three dogs at once just by buying additional collars. An option for continuous shock or momentary shock gives you the power to correct misbehavior or arrest your dog’s motion if she is running into danger or giving into aggression. ¾ mile range. This is a good range for hunting dogs or family dogs at large parks. Comes with two year warranty. Life can be hard on a collar. A warranty can put your mind at ease if you are buying a collar for a dog that lives rough. Not as expensive as comparable products. Why pay more for an emergency safety mechanism for your dog? This affordable collar does the job for less. Works for up to three dogs at once with just the purchase of additional collars you can control three dogs with one receiver. Ten levels of continuous or momentary shock. The shock isn’t as adjustable as with some competing collars, but the option for continuous or momentary shock can be extremely useful if your dog is running hard at danger. Users appreciated the affordability of this effective tool, as well as its capacity to control up to three dogs just with the purchase of more collars. The option for continuous or momentary shock is great for powerful and high-drive dogs that may not respond to momentary shocks. The collar receiver is pretty big and bulky, which some users found bothersome when discreteness was a priority or when hunting dogs needed to move through thick brush. Here is an effective remote training collar that was made for use with sporting dogs but works great for all kinds of uses. The intuitive design allows you to operate it without looking, once you get the hang of it. If your dog doesn’t just swim, but actually dives, this might be a good choice for you, since it is submersible to 25 feet. Most collars that are waterproof can’t handle this kind of submersion, so if you have a duck dog or a dock diver, this might be the pick for you. ¾ mile range. This long range is appropriate for hunting dogs and sporting dogs, especially in the water. Comes with two year warranty. If your dog dives deep and lives a rough life, you may wonder how long this collar will last. A warranty like this can put your mind at rest. Not as expensive as comparable products. This isn’t the cheapest collar on the market, but when you consider its extensive features, it is a good value. Ten levels of continuous or momentary shock. Continuous shock can put your mind at ease if you have a high-drive dog who may ignore a momentary shock. Owners of water-loving dogs let their dogs dive to their heart’s content when they bought this collar, since it is submersible further than even the most dedicated dog is likely to go. It also offers continuous shock, which is an extra safety measure that is important for powerful and high-drive dogs. The receiver screen can be difficult to see in the dark, making this a better option for daytime use. 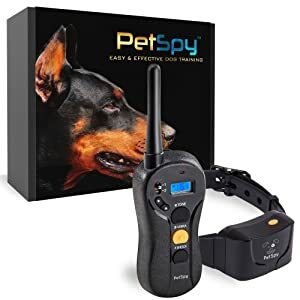 If you are looking for an affordable remote training collar with great range that is suitable for both everyday pet owners and professional trainers, this might be a good choice for you. Blind operation design makes it easy to use this collar while you keep your eyes on your dog. The collar is backed by a lifetime replacement warranty. Just contact the company if your collar should malfunction. 650 yards. This is a good range for family dogs and trainers working in parks or on walks. Blind operation. You will be able to operate this collar without looking at it once you get over the brief learning curb. This means that you can communicate continuously with your dog without taking your eyes off of her. Lifetime replacement warranty. An impressive warranty for a product that has a high probability of being damaged in the course of use. If you know you and your dog will be hard on the collar, this can be an attractive feature for you. Charges quickly. Don’t wait around for the collar to change with this rapidly charging unit. Convenient lanyard or belt clip for controller. You are likely to want to carry this remote most of the time and have it ready at hand if you need it. Professional trainers and regular dog owners alike appreciate how affordable and easy to use this collar is. The last thing you want to do in an emergency is take your eyes off your dog, so blind operation is a very useful feature. 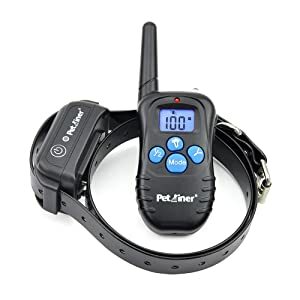 The connection points of this collar are a bit more sensitive than competition seems to be so the shock may not work correctly unless the collar is lying just right on your dog’s neck. This convenient collar offers a lot of features and a good range for a reasonable price. It is a great collar for hunters, even those who hunt at night, thanks to the light feature. The ergonomic build makes it easy to hold, and big, well-separated buttons are easy to press even if you have some arthritis. The durable collar is lightweight and waterproof. The long-lasting battery in both collar and remote charge quickly and simultaneously. Light as well as shock, vibration, and tone. Light is a great feature for nighttime use, and isn’t common in remote collars. Vibration and shock adjustable from 1-100. Choose exactly the stimulation level that is effective for your dog and no more. Waterproof and durable. This handle can handle a lot of abuse and submersion in water. Works for dogs of different sizes. From 10 pounds to a 100, this collar is safe and effective. 1600 foot range. Advanced antenna design allows for a long range at the price. Ergonomic grip. Big separate buttons are easy to handle. Most users found the shock on this collar to be very effective and the controller easy to use. The light function is especially appreciated by night time users. Some users found the shock ineffective on their unit. This is an affordable remote collar is appropriate for training family dogs. Dual channels make training two dogs at once easy. The discrete controller fits easily into your pocket, and the concave design makes it easy to feel which button is which for blind operation. Durable, waterproof construction will keep this collar going well past its three-year warranty. Soft and easy to adjust collar. Your dog will likely be wearing the collar a lot of the time, so you want a comfortable collar for her. Works for one or two dogs. Model available for one or two dogs. Users appreciate how easy it is to manipulate this controller, even without looking, thanks to the concave design. The discrete construction also makes it easy to fit in your pocket. Users generally found that the company honored the warranty when mishaps befell this collar in the three-year warranty period. The soft strap of this collar may not be as durable as some less comfortable, heavier duty straps, and some people found that it broke before the receiver did. 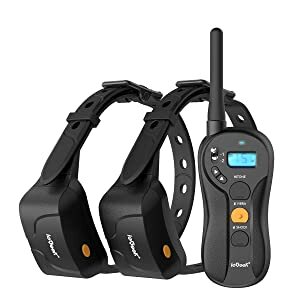 If you have two dogs to control and not a lot of money to spend on training collars, you may like this affordable remote training system that comes with two collars included. It has one of the higher effective ranges that you are likely to find at this price, and when you consider that two collars are included, this is a real bargain. Extra conductive silicone to protect your dog’s skin. You don’t want your dog to be hurt when you use the shock feature in an emergency, and silicone works well to conduct the shock without hurting your dog’s skin. Comes with two collars. This is a great price for two collars out of the box. If you have two dogs to train, this may be the collar for you. Light, beep, vibration and shock modes. This is one of the few remote collars that offers light as well as vibration and shock. If you want to be able to see both of your dog’s locations when training at night this might be the one for you. Supports up to three dogs. If you add a third dog to your pack you can buy an additional collar. Users like this affordable remote collar, especially since it has features that can be hard to find, like a light function and extra conductive silicone. That it comes with two collars is icing on the cake. Even if you only have one dog, you can use one collar while you charge the other. This collar goes into standby mode to save battery, which is nice except that it creates a delay when communicating with the collar while the user switches out of standby, which can be frustrating. 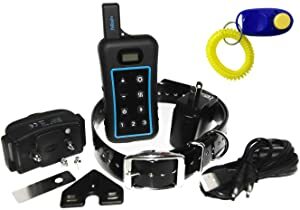 The training tool that is commonly known as a shock collar, remote training collar, electric dog collar or e-collar, can do much more than shock. When used as part of a positive training regiment, the shock will never be used except as an emergency measure. Remote training collars have a tone or beep which can be tied to positive reinforcement to enforce recalls or other desirable behavior. Training collars also have a vibration which gets the dog’s attention without any pain. Some shock collars have variable settings for the vibration as well as the shock. Whether you are a first-time dog owner worried about keeping your dog safe, an experienced dog owner who wants to push the limits of obedience, hunting, or canine sports, are you are a trainer working with clients’ dogs on problem behavior, a remote training collar can be a useful tool for you. A remote training collar communicates to your dog no matter where she is. By tying tone or vibration to a reward, you can continuously tell your dog when she is doing the right thing. If you tie the tone to a behavior like coming back to you, you can feel confident that whenever you press the tone your dog will return to you. The consistent tone is similar to a clicker, but unlike a clicker it can go with your dog and provide the same stimulus continuously. Vibration can be more effective than a tone at getting a dog’s attention. Vibration is great for deaf dogs as well. While we hope you will never need to use the shock feature on your dog, if your dog is running towards traffic or about to attack another dog or person, a shock is much better than the alternative. It is your responsibility as a dog handler to keep your dog out of situations in which a shock would be necessary, and you should never trust that the shock will be effective. A very determined dog or a dog who is in extremely high drive mode can block out even an intense shock. That said, a dog that likes to joy run out the front door or just can’t contain herself at the sight of another canine can be stopped from running into the road effectively by a shock if other containment measures and training fails. Hunters have long struggled to train their dogs to stay near and return to them when called, as well as to remotely listen to commands to help them find the game. Remote training collars can help hunters communicate with their dogs remotely to zero in on game. Furthermore, if a hunting dog in training should be unexpectedly distracted by a distraction like a rabbit or deer running by, the shock feature can keep the hunting dog from running off and becoming lost. Hunters can benefit from using a GPS collar as well, in case they lose track of their dogs despite the remote training collar. The GPS collar can allow you to find your dog no matter where she runs to. Shock is delivered by two prongs, either metal or metal coated with silicone. Quality shock collars offer a wide range of shock. The lowest setting should be barely felt by even a small dog, while the highest setting is more than most people can handle. ALWAYS use any measure of shock on yourself before even thinking about using it on your dog. Don’t use the shock except in an emergency situation, as it will hurt the relationship that you have with your dog and may also condition her to ignore the shock, requiring higher and higher levels. The shock that is delivered is static electricity. The lowest setting is a twinge less than the shock from touching a car door with static energy, while the highest settings create a sharp shock that will make most dogs forget about anything but the shock. You can choose and adjust the shock level using the remote, then stimulate a momentary or continuous shock. Vibration is provided by another feature within the collar that causes the unit to vibrate when triggered. Some collars have adjustable vibration while others provide a single level of vibration. The tone is produced by a speaker within the collar receiver. Some collars have more than one tone, but most have only one clear, attention getting note. Some collars feature light. The light flashes out from a generally LED light within the collar receiver when the button is pushed. There are many uses for remote collars. Many owners keep remote collars on their dogs whenever the dog is awake or every time they leave the house with the dog. The shock collar can serve to communicate with the dog easily. Remember that a lead should never be attached to the collar, as the collar is not designed for this. A beep can signal a positive behavior which you can then reinforce with treats, toys, or affection. A vibration can warn a dog that her behavior is not desirable. If the dog refuses to stop and is entering a dangerous situation and you can’t interfere with the behavior you can use a shock correction as an emergency measure. Shock collars are also used for dogs that need to be off leash to perform a function like hunting. Dogs that are generally good off-leash but have triggers like prey-drive or want to meet other dogs can be stopped from running into traffic or other dangers by a shock collar. To keep your dog from running away. If your dog is an escape artist, slipping out from between guests’ legs or jumping fences, you can use the vibration to warn and the shock to stop your dog from running away into potential danger. To control your dog if you lose control. If your dog has high prey drive or aggression towards people or other dogs, you can use the beep to condition positive behavior and the shock in case you lose control, to break up a fight or stop your dog’s progress towards the object of aggression. Keep in mind that a dog in the “red zone”, or in very intense drive may ignore the shock or it may even elevate aggression. It is advised that you work with a trainer or animal behaviorist when working with aggressive dogs. For hunting. Hunters have always struggled to train dogs remotely, especially since hunting dogs so often have high energy and drive. A remote collar serves as continuous communication and an emergency measure in case the dog takes off. Consistent beep coming from the same place on the dog’s neck ties strongly to reward with training. A strong tie between stimulus and reward is important to get dogs to respond to the stimulus even under distractions, so this consistent stimulus is very useful and can be more effective than a clicker. Vibration startles dogs. If you are having trouble getting your dog’s attention, you don’t have to resort to shock. The vibration is an effective way to startle dogs and get their attention when they would rather ignore you. Shock can stop dogs that are running into danger or will become a danger to others. A shock can be a highly effective emergency measure to stop dogs in mid-run that otherwise would be impossible to stop. Can damage the bond between dog and handler, especially if used incorrectly. If you think that because you are behind your dog or out of sight when you shock her she won’t know you did it, you can think again. Your dog will quickly come to understand that you are the one shocking her, which can hurt the relationship between you. May cause physical harm. Some dogs experience rawness and redness around the contact points, especially when shocked strongly or repeatedly. Makes training dependent on technology. Some dogs will realize that they only get shocked when the collar is on and ignore commands without it. Some dogs won’t perform without the collar beep to cue the coming reward, even with a lot of training. Higher range collars can be expensive. Especially compared to the alternative training technique: a long line, this can be an expensive tool. A GPS collar for safety will cost even more. There is a lot of stigma attached to shock collars for good reason. Shocking your dog for undesirable behavior is not part of a positive training program. A shock can result in a reduction of the trust that your dog has for you and may cause anxiety or aggression. Causing physical pain to your dog either by striking her with your hand or delivering a shock has similar undesirable psychological consequences on the dog and the owner. Furthermore, this kind of training has been proven to be less effective than positives, relational training techniques. The shock delivered by the collar is designed to be harmless to your dog, but repeated uses or extended shocks at high voltage can damage the skin on your dog’s neck. Some dogs that suffer from preexisting sensitivities, heart conditions, or neurologic conditions can have aggravations to their conditions as a result of even mild shocks, so check with your veterinarian before using the shock with your dog. The beep and vibration, on the other hand, are generally safe. At the mildest setting, shock collars are not painful, but the higher settings can be very painful. If you are considering using a shock collar on your dog, use it on yourself first in increasingly higher settings. Make sure that you know exactly what you are doing to your dog. Dogs trained using aversive techniques may not be as trusting of their handlers or as reliable in their performance, besides being stressed. Use the shock only as a last resort in emergencies, and rely on positive conditioning using the beep and vibration. While remote training collars used in the beep or vibration setting can be very good at reconditioning aggressive dogs and getting their attention, using the shock setting will have an undesired effect. If you are working with an aggressive dog, don’t ever rely on the shock feature to stop your dog or use it to punish your dog. If you are following a positive training protocol with your dog and are considering adding a remote training collar to your training regiment, there are some very good reasons to make the leap. If your dog has a hard time responding to you at a distance or when there are a lot of distractions, the consistent tone tied to a reward can get her attention and bring about the desired behavior. Vibration can surprise your dog out of inappropriate behavior. 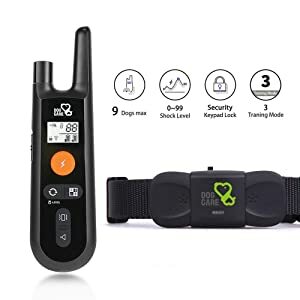 If you are confident that you have a positive training protocol that will work with your dog using a remote collar and plan to only use the shock for an emergency, the remote collar might be a great choice to train your dog. A shock collar is generally thought of as being an adverse training tool, but there are many ways to use it positively. Read these tips for training using a shock collar. Does your dog jump on guests when they come to your home or when taking walks? Puppies express their joy and love with people by jumping, and it can be hard to overcome this as they get older. It isn’t necessary to use a shock to prevent your dog from jumping on you or other people. Tie the sound of the beep to sitting for a treat, favorite toy, or affection. When you think your dog is about to jump, beep. When she sits, have your guest greet her or reward her with a treat or toy. Barking is about as normal as it gets for a dog, and yet it is one of the most complained about behaviors when dogs are surrendered to animal shelters. Use a shock collar to stop barking by vibrating to distract from barking, then rewarding the resulting silence. Fighting between dogs within a household is not uncommon, but it can be very stressful and potentially dangerous for both the dogs and people in the house. A remote training collar can be helpful to prevent fighting if used by a watchful handler. The trick is to trigger the vibration at the instant that you see tension between the dogs. This will break the dogs’ focus, at which point you can call them and reward for calm behavior. If your dog does things you don’t like when you’re not looking, like digging in the yard, you can trick her into thinking that you can see her all of the time. Teach your dog to come for a reward when she hears the beep, then watch through a window and ask your dog to come whenever she digs in the wrong place. Soon she will learn to only dig in a designated place. It is wise to provide somewhere for your dog to dig, since so many dogs love this activity. Dogs that whine or bark continuously can annoy you, your family, and your neighbors. Dogs that whine are often bored or nervous. 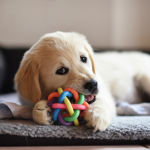 Tie a beep to a great puzzle game or food toy, then gradually stretch out the time that your dog has to wait between beep and puzzle until a beep will quiet her for some time before the reward. One of the most common uses of a shock collar is to prevent dogs from running away or giving into prey drive by chasing a cat or going after a squirrel. This is one of the few instances in which a shock is a reasonable training measure since a dog running away can put himself into serious danger. Train a recall by tying the beep to a treat and use long line training before progressing to off leash. Don’t test your dog in dangerous situations like near a road. 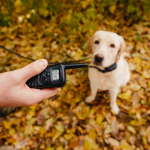 If your dog gets away from you or takes off and doesn’t respond to the beep or repeated beeps, use a quick burst and then extended shock to arrest her motion. 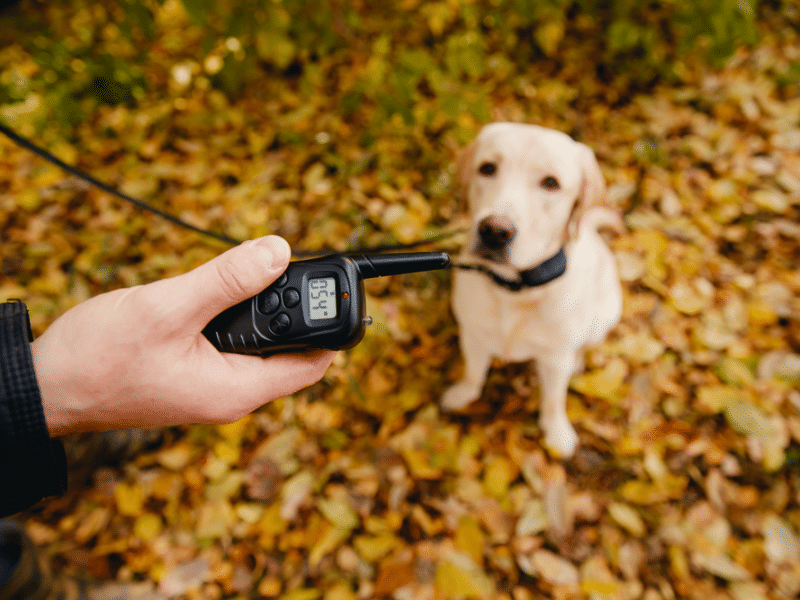 A remote dog shock collar can be a very useful training and safety tool for your dog if used properly. Most dogs should never require you to use the shock function, but if you need to stop a dog who is running towards traffic or taking off after the neighbor’s cat, a shock collar could save your dog’s life.